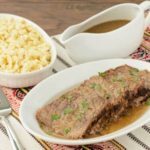 A recipe for Sauerbraten which is a German-style marinated roast. It is marinated for several days and then slow-simmered for hours. It also has a sauce and is served with noodles and dumplings. In a medium saucepan, add all the marinade ingredients except the beef and bring to a boil. Remove from the heat and cool to room temperature. Place the beef in a deep, non-reactive bowl (glass, plastic, or ceramic). Pour marinade over beef. The marinade should be at least halfway up the sides of the roast. Cover and refrigerate for 2 to 3 days, turning the meat in the marinade at least twice each day. Take the beef out of the marinade and dry it. Strain the marinade and reserve the liquid. Discard the vegetables and spices. In a 7- to 8-quart pot or dutch oven over medium-hight heat, add the oil and butter and get to almost smoking. Sprinkle the beef with salt and pepper. Add the beef to the pot and sear to brown on all sides, about 2 or 3 minutes per side. Turn the heat to medium and add the onion. Cook until onion has softened. Add 1 cup of water to the strained marinade. Pour in enough of the marinade so it is about 1- to 1 1/2-inch deep around the beef. Bring to a boil then reduce heat to a simmer. Cover and cook on low until done, about 2 to 2 1/2 hours. Remove the beef from the pot and let set for 10 to 15 minutes. Slice the beef and place on a serving platter. Cover with aluminum foil to keep warm. Add the beef base/bouillon to the pot and stir. Bring the sauce to a simmer. To thicken the sauce, slowly add in a portion of the dissolved cornstarch, whisking while pouring. Allow it to cook for 1 to 2 minutes and add more if too thin. Add the sour cream to the sauce and whisk to combine. Cook for 2 to 3 minutes. Transfer sauce to a gravy boat or bowl. Total time does not include time for marinating (2 to 3 days).